So I'm not sure how well the last music post went over with all of you, but I fell in love again. I heard the song "The Beacon" while watching The Hills and immediately looked it up online. 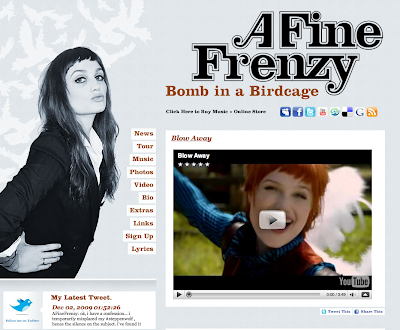 Turns out 24-year-old Alison Sudol is the leading lady behind A Fine Frenzy, and she is one talented cookie. I'd recommend giving her music a listen. I've included a few songs I really like below, including "The Beacon," which I'll admit is a bit melancholy, along with "Almost Lover," BUT it's all really beautiful. If slow songs aren't your thing, try"Blow Away" and "What I Wouldn't Do" for some bouncier tunes.